Now Bob’s Burgers fan can have this fun Louise pink and green backpack. 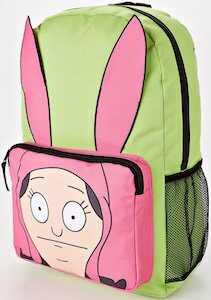 The backpack is light green in color just like the dress that Louise Belcher wears and then on the back pocket you can see her face and her pink bunny ears hat and the bunny ears stick all the way to the top. The Bob’s Burgers backpack has also two mesh pockets on the side for things like an apple or a water bottle. Inside the 17 x 11 x 6 inch backpack you will also have a laptop sleeve to store you computer securely. A backpack like this is something true Bob’s Burgers fans will think is fun to have.